It is hard to increase traffic to your website for fee but it is not an impossible task to achieve. If you follow right strategy and apply right marketing tactics, then you can easily increase traffic to your website. We all know that the best way to increase website traffic is to gain rankings in SERP (Search Engine Result Page) by doing the right SEO. You could get the most valuable traffic is generated by SEO. Website Content: You should always write the high quality content on website. Provide value for your potential readers. Write the content which is can cover your website content and is relatable to your website services or product. Keyword Research: Do the keyword research before creating or using the keywords in your content. Don’t just stuff keywords in your content. Instead focus on building your own brand keywords which can create value to your product or services. Social Media: use Social media wisely to increase traffic to your website. For this you can join relevant business groups, publish a link to your website. But do not use it excessively or more frequently. It might create negative impression between people or group admins who can block you from posting content. Cooperate with influencers: This requires some money, but you will get relevant visitors to your website. Cooperate with popular web resources and ask them to mention your website or blog in their articles. Or write articles by yourself and place it in their resources. Engage with users: While representing your website or services on multiple social platforms, you should prove a better response rate. Focus on engaging with your visitors and convert frequent visitors into permanent users. Get Mobile Friendly Website: The desktop searches were taken over by mobile searches in 2014. Now the ratio of mobile searches vs desktop searches are 60:40. Where 60% of searches are generated by mobile devices. Hope it is a good reason to get a mobile friendly website. Website Loading/Response Time: This small change could give you biggest numbers in website visitors. Most of the users don’t consider websites which takes longer time to respond. It causes higher bounce rate & negative customer experience. HTML Pages: Create light HTML pages to represent your website product or services. Each page should have relevant Meta data and keywords to represent content. It enables search engine crawlers to understand your website content easily and show them in SERP. Website Structured Data & Sitemaps: Create structured data for your website so that crawlers could read the website data structure easily and can crawl your website or blog pages according to its relevance. Having a sitemap makes it easy for search engine crawlers to crawl your website frequently. Use of Power words: Using power words along with product or services pages would help you to generate curiosity & interest between visitors in your website content. Power words are nothing but a way to represent content more effectively. For example if you are using word “Fee” anywhere on your website’s product page or services page then you can user a power word “Absolutely” and represent free as “Absolutely Free”. If you are using word “services” then you can represent it as “Amazing Services”. Power Words would help you to add more value in your content. 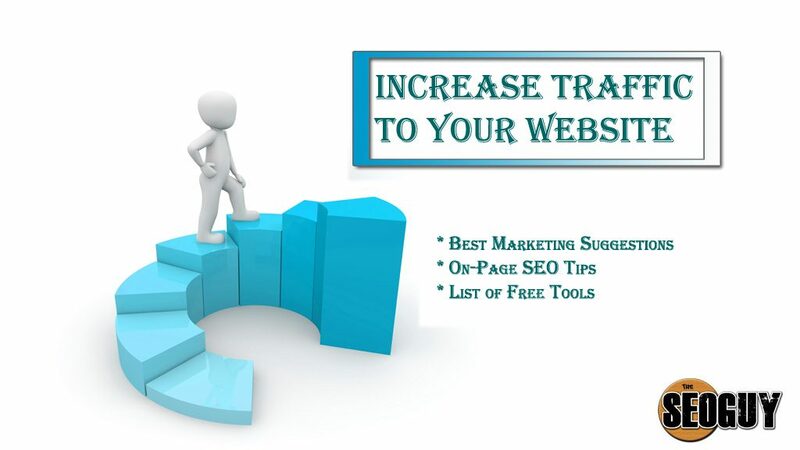 There are thousands of tools available by which you can increase traffic to your website. I am sharing few best free tools to do that. Pro Tip: You should also consider things such as backlinking & social signals to support your On-Page SEO Strategies. Generating high quality backlinks would certainly be helpful in this. Nothing beats the traffic generated organically. Hope these suggestions would help you to increase traffic to your website or blog. If you have more suggestions then do comment below.